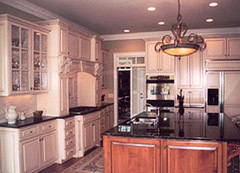 Custom kitchen cabinets let you add your personal touch to your new home. The custom cabinetry you select is sure to be a highlight in your home. If your kitchen has an old worn out feel, perhaps simply installing new doors and drawers is all you need. You will be amazed at the fresh look this change can bring. The cost is a fraction of replacing the entire cabinets. With dozens of door and drawer styles to choose from, we certainly offer what you have in mind.